An unassuming craftsman, legendary car builder Dean Jeffries has always preferred to let his creations speak for themselves. This book provides a rare, close-up look at the man, and the life, behind the Mantaray, the Monkeemobile, the Green Hornet’s Black Beauty, and James Bond’s moon buggy, among countless others. Drawing on extensive interviews with Jeffries, bestselling Motorbooks author Tom Cotter gives readers the inside story on how, with little more than determination, raw talent, and a high school education, Jeffries became such an extraordinary figure in the automotive world. Cotter details the multiple careers Jeffries mastered at once, from custom painting and pinstriping to metal shaping and design. 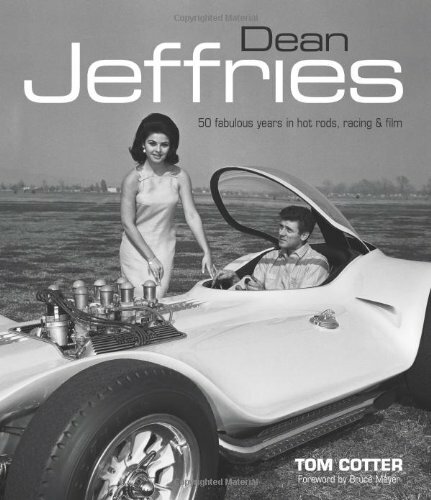 The book offers Jeffries’ own account of the circumstances behind the famous TV and movie cars that followed, as well as the relationships he enjoyed with personalities as varied as A. J. Foyt, Steve McQueen, James Dean, Bruce Lee, Parnelli Jones, and Elvis Presley. Cotter also chronicles Jeffries’ work on well-known hot rods, sports cars, and Indy racers—including the 21 starting cars Jeffries painted in a single Indianapolis 500. Featuring more than 200 images from Jeffries’ own archive, here finally is a book that truly brings to life the man behind the legend.